Why do I PMC? I PMC because I'm selfish. My commitment stems from what I want. I want to be part of a world where so many people come together to commit themselves to the eradication of a disease that has affected so many lives. My life was greatly altered when my father was diagnosed with Leukemia in the early Nineteen Seventies. He fought for others, as he did in WW II when offered himself for experimental treatment when his fight became one with so many others. He lost his fight in 1974 at Sixty years old. Cancer was still not well understood then and the funding for research was low. Since then, I've seen too many others' lives changed for the worse. 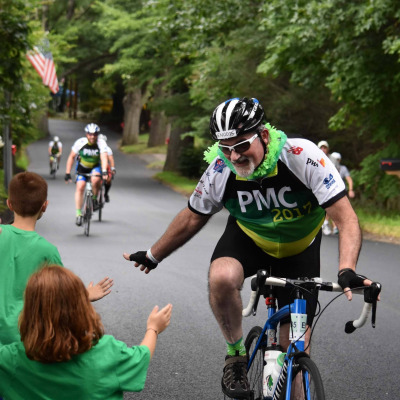 However, as part of the PMC and Dana-Farber, I can be one of the thousands of people who ride to make a difference! I want to feel and support the hope and will of the many cancer survivors and their families who I've been fortunate to meet and ride within the PMC community since 2014. It is never too late to make a difference! I am extremely grateful for the opportunity to be a part of the PMC!